CLEVELAND (March 31, 2015) – Performance automotive manufacturing company, Mr. Gasket, has introduced a line of Micro Electric Fuel Pumps for a wide range of import and domestic gasoline, diesel, ethanol, methanol and E85 fuel applications. These electric fuel pumps provide auxiliary fuel flow for carbureted engines, helping to combat vapor lock by providing consistent and reliable fuel delivery. 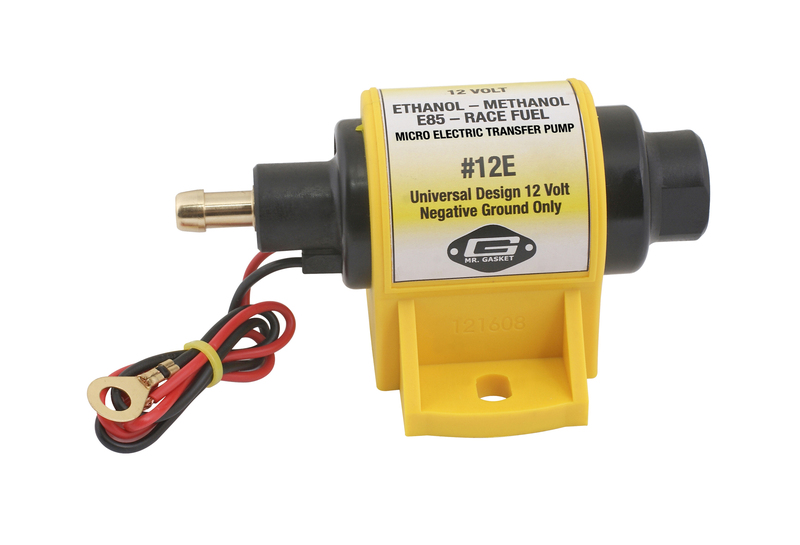 Each Micro Electric Fuel Pump is a self-priming gravity fed pump, featuring a low amperage draw design with solid state electronics that’s lightweight and ideal for providing fuel delivery in carbureted street cars and trucks, as well as transferring fuel between auxiliary tanks in trucks and commercial usage. Available with flow rates of 28 gallons per hour at 2-3.5 PSI for import gasoline applications, and 35 gallons per hour at 4-7 PSI for domestic, gasoline, diesel, ethanol, methanol and E85 engine applications, every Mr. Gasket fuel pump is universally compatible with all carbureted, 12-volt negative ground electrical systems. Each Mr. Gasket Micro Electric Fuel Pump comes complete with a fuel filter along with all necessary fittings and hardware. Installation can be accomplished with just simple hand tools. Mr. Gasket Micro Electric Fuel Pumps are available from $50.95 at retailers nationwide and online. For more information on Mr. Gasket’s fuel pumps, or the company’s complete line of products, visit www.Mr-Gasket.com.